Just the thought of France, and my brain instantly slips into sensory overload. I start recalling the delights of a Michelin-starred restaurant, a drive through Provence, the smell of a freshly baked pain au chocolat, a walk along the Seine—okay, you get the idea. Is it any wonder that I completely forget about the country’s thriving audio industry? Indeed that business is very much alive, as leading French brands such as Focal, Devialet, Micromega, Triangle, and many others prove every day. Atoll Electronics or “Electronique” however, was new to my experience, though the company has been manufacturing gear since 1997. Founded by brothers Stéphane and Emmanuel Dubreuil, its mission was to produce reasonably priced, true high-end audio electronics for budget-conscious audiophiles. Today its product offerings consist of over fifty unique components that are fully designed, engineered, and manufactured in Brécey, a town located in the Normandy region in the northwest of France. The IN400SE represents the company’s elite integrated amplifier. It joins separates siblings—the PR400 preamp and the AM400 amplifier—in Atoll’s Line 400 range. While beauty is certainly in the eye of the beholder, I find the look of the amp unreservedly elegant with a unique aesthetic highlighted by its terraced heatsinks and matte-aluminum front panel. The IN400SE outputs 160Wpc into 8 ohms (300Wpc into 4 ohms) and employs differential dual-mono discrete construction. The output devices are MOSFET, eight transistors per channel, and there’s a hefty 93,400 µF of capacitance in reserve. The audio input capacitors are Mundorf. Atoll specified very low amounts of global feedback, and also employs high current into the driver stages to limit distortion. The high bias allows the IN400SE to operate in a Class A for the first ten watts before going into Class AB operation. The chassis is constructed of a 2mm steel baseplate and a 10mm machined-aluminum front panel. The aforementioned heatsinks are manufactured in massive aluminum blocks from a process developed by Atoll. They were designed to best absorb mechanical vibrations and promote heat dissipation for the sensitive output devices. Moreover, Atoll is especially proud of its efforts to ensure that major components are sourced from suppliers located in France or within the E.U. but all come from within reach of the main assembly plant. For example, chassis are made in Brittany, the aluminum front plates are laser-cut in Lorraine, circuit mother-boards are made in Pays Basque, power supplies are made in the Rhône sub-region, packaging is sourced from the famous Normandy province, and so forth. The IN400SE’s front panel features a pair of aluminum knobs for volume and input selection (and standby) plus a ¼" jack for its internal headphone amplifier. A quick press of the volume control enables basic configuration options. Rather unexpected was the setting that illuminates the knobs in either blue and red (the French flag’s colors!) or, for a more somber look, bypasses the mood lighting entirely. The inset front-panel display can also be dimmed or set to time out completely after a few seconds following any remote control input engagement. Turning to the back panel, the IN400SE provides five analog RCA inputs, a dedicated home-theater bypass, and one set of XLR balanced inputs. In addition there are two RCA sets of preamplifier outputs for potential biamping or to drive a subwoofer. My review sample also included the standard on-board DAC with a USB “B” input for decoding files up to 24-bit/96kHz (other digital input options available; see Specs & Pricing). The five-way WBT binding posts are top-quality. Noteworthy too is that the wiring of the binding posts and the RCA/XLR I/Os to the PCB board are of made of high-quality silver and Teflon. The remote control was comprehensive in terms of control but lacked much in the way of tactile feel—it’s pretty standard-issue. Atoll mandates a signal path free of bass or treble controls, as the company concludes that the added circuitry introduces non-linear frequency and phase responses and noise that hampers transparency. Thankfully, however, there is a balance control—useful for optimizing many off-kilter recordings. The volume control is based on a pair of Ti LM1972 attenuators, one per channel based on commuted resistors. In this way, Atoll minimizes the length of the audio copper tracks and enhances stereo separation. 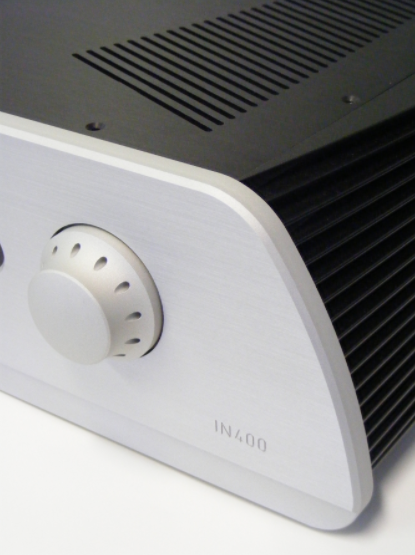 If it’s possible for an amplifier to be instantly likeable, the IN400SE was a case in point. It almost seemed to be beckoning to every loudspeaker system, “Hey, come on out and play.” It’s a personality that stems from a firmly grounded foundation that imparted recordings with an immediate sense of stability and weight. That’s not to say it’s slow, or drags its feet in speed and response. Rather, it has a darker gravity that suggests power, control, and grip in copious reserves. It’s particularly unerring in its reproduction of acoustic instruments. For example, there’s the rhythmic underpinning of Jim Keltner’s kickdrum during Vanessa Fernandez’s cover of “Ramble On” from When the Levee Breaks [Groove Note]. Initially its timbre and sustain sounded damped almost to the point of appearing muted, but then following just behind the transient came the whoosh of propulsive energy after every strike of the drum pedal mallet. It’s a complicated low-level relationship that was nicely sorted out by the IN400SE. Jen Chapin’s Stevie Wonder cover of “You Haven’t Done Nothin’” provided a vivid example of what this amp was doing right in open-throated dynamics and natural, unhyped timbral elements. Comprising only three instruments—acoustic bass, baritone sax, and Chapin’s smoky vocal—this Chesky SACD suggests a deceptively simple recording. I’ve heard it sound open, smooth, and intensely dynamic and detailed; conversely it has also sounded awful—an edgy treble, compressed and flat. The IN400SE (with the redoubtable dCS Puccini as source) reproduced this track with very little artifice. There were rich and relaxed harmonics and a sense of immersion that was competitive with some of the best amplification I’ve experienced. On a similarly minimalist track such as Lyle Lovett’s “Baltimore,” the sole acoustic guitar, close-miked, was allowed to bloom fully into the surrounding acoustic space, every transient detail and resonance nicely realized.